White water rafting in Croatia is relatively new activity, and thus not so well-known around the world yet. But, Croatia does have wonderful white water rafting sites, from Karlovac to the north, Gorski Kotar to the west, and Dalmatia to the south. The most popular rivers for white water rafting in Croatia are Mreznica, Dobra, Kupa, Korana, Una, Zrmanja, and Cetina. Most rivers have a difficulty grade 3. I've experienced a white water rafting in Croatia for the first time on the river Mreznica, and then couple of years afterwards on the river Kupa. Located less than 80 km from Zagreb, river Mreznica is one of the most popular spots for white water rafting in Croatia. Rafting on Mreznica is relatively easy, and a perfect choice for the first white water rafting experience. The river consists of small lakes, interconnected with many small and medium size waterfalls. Local agencies offer a number of slightly different trips in regards to meeting/return location, a level of difficulty, and a length. Meeting point is usually in the village of Zvecaj, at the Zeleni kutak restaurant. From there, skippers take you on a minivan upstream, either in Generalski Stol (shorter and easier route) or Primislje. The rafting trips take approx. four hours, out of which 2.30 hours of active paddling. Both routes takes you across small waterfalls that can be easily passed on a raft, and without any rafting knowledge. The only waterfall that cannot be passed with raft, but it requires a short walk, is an 8-meter high Mreznica Waterfall. The water is crystal clear, clean and has a wonderful shades of green. You'll be able to see many birds, wonderful forest, old mills, and pass by a string of freshwater springs. The best time for rafting on Mreznica is in spring and fall when the river has the highest water level. 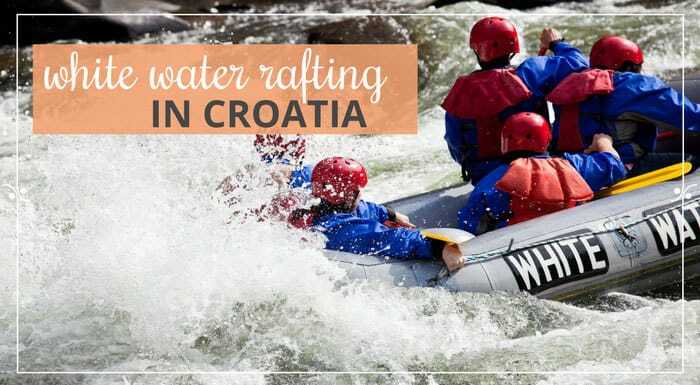 However, the most popular time for rafting is in summer, from June to September, when there are many tourists visiting Croatia and partaking in white water rafting. Water in summer months is as warm as 26 °C. It remains at 10 °C around natural springs. If you don't like group tours, and you find 4 hour trips too long to join in, you can rent a small canoe or kayak at the restaurant Zeleni kut, paddle around and enjoy a swim, or a natural whirlpool among waterfalls. White water rafting in Croatia | Pin Me For Later! With its proximity to Zagreb (only 70 km from Croatian capital), Dobra was the first river where organized rafting trips in Croatia took place over 20 years ago. And Dobra still remains the most popular rafting destination for locals if not for tourists, regardless of a new hydro-power plant that has been built on Dobra since then. Unfortunately some of the best rafting sites disappeared with a dam. Today, rafting conditions on Dobra river are good all year around. Dobra is a grade II and III river for rafting, its rapids are easy, and the scenery is lovely. Rafting trip takes 4 hours in total, out of which just over two hours of paddling. The route goes from a village of Leace to a village of Jarcepolje. Kupa is another popular rafting and kayaking destination in Croatia. Located in Gorski Kotar region, along the Croatian-Slovenian border, Kupa offers stunning scenery. Paddling is along the narrow gorge surrounded by thick pine forest on both sides. Kupa, being a grade I-II, offers recreational rafting for all ages with few easy rapids that make the ride fun. Rafting takes place only when the water is high; the best time for white water rafting on the river Kupa is in Spring (particularly in May). During the summer (June through September) kayaking replaces rafting. A rafting trip takes two hours whit high water levels, or up to 4 hours when the level of the water is low. Korana is a popular rafting destination among professionals, due to a yearly international rafting competition “Rast Raft” (I know it sounds made up!). Rafting on Korana will reveal to you parts of river that are otherwise unaccessible. The route takes you across more than thirty waterfalls. Besides few old watermills, you won't see any settlement on this route. The length is 10 km, but if you are an experienced rafter you can also arrange a longer, 15 km route, that crosses Rastoke, the most extreme part of the river. Una River makes a natural border between Croatia and Bosnia. Rafting on Una river is extremely popular, especially among young party-seekers. And although there are Croatian agencies that organize rafting on Una, two most popular rafting agencies are in Bosnia: Kiro and Bijeli. Strbacki Buk-Lahovo, is a 15 km long route passing entirely through the Una National Park. This route is relatively challenging, especially the first part of the trip being a IV and V grade river. The trip takes 5 hours in total, out of which 4 hours of paddling. Recreational, 13 km long route from Kostela to Grmusa is a perfect trip for beginner rafters and for families with children. Trip takes just over 4 hours, out of which almost 3 hours of paddling. The longest route, from Kostela to Bosanska Krupa, has a difficulty level of II and III, and it's suitable to all ages and people who enjoy spending longer time in a raft. The trip takes 6 hours in total, with full 5 hours paddling. Bijeli also offers fun 6 km night rafting route. A short in-town paddling with a beer stop. River Zrmanja, along with Cetina river (see below) is the most popular spot white water rafting in Dalmatia. The river is located in the vicinity of Zadar. Zrmanja river passes through spectacular, 200 m deep canyon, and on its way it creates wonderful travertine waterfalls, cascades and rapids. A rafting trip usually starts at the village of Kastel Zegarski and ends at the village of Muskovci where the lunch is served. The trip lasts up to 7 hours in total, with three hours of paddling, about an hour of swimming and relaxing, two hours for lunch, and an hour for safety tips, and organization. The route passes across the biggest waterfall in this area – the waterfall Visoki buk. A waterfall is crossed by a 5 min long walk. During the summer, I and II level rapids are easy to cross, while during the fall and spring the rapids are category II and III. There are many agencies offering rafting trips to Zrmanja River. The most popular agencies are Raftrek, Huckfinn, and F-Zrmanja. Cetina river is becoming one of the most popular spots in Croatia for outdoor enthusiasts. Cetina river meets the Adriatic Sea in Omis, a small seaside town, 20 km south of Split. This 11 km long rafting trip starts in a village of Penšići, near Pavića most, the old stone bridge and it ends near popular restaurant Radmanove Mlinice, where you can have a lunch. The trip takes three hours, through level II and III rapids. The first part of the trip is easy, and it basically takes lots of paddling. The nature is beautiful, the river is crystal clear. The first stop is usually timed for a small lake, where you can have a swim during the warm summer months. The next stop is near the dam, and a dangerous rapid called Oblacnik, a natural barrier, that needs to be crossed by foot. However, this short walk takes you through an interesting cave. The rest of the trip is actually the most interesting part of the river with lots of rapids, and a waterfall Studenci. You'll also pass through Tisne Stine, extreme, only 10 m wide canyon between two 50 m high cliffs. The trip ends in a popular restaurant Radmanove Mlinice where you can have a lunch. There are many local agencies organizing rafting trips to Cetina River. However, the best way to book it is through some of the large agencies offering adventure tours all over Croatia, like Raftrek, and Huck Finn. Have you ever been on a white water rafting trip? Share your experience in the comments below. What route would you take if you were coming from Italy down to Split? It depends! If you have time, and don’t mind curvey roads, take Adriatic coastal road. If you are in rush, highway Rijeka-Zagreb would be the best solution for you. Waterfalls are my favorite thing… and I am trying to pick between kayaking Zrmanja and Mreznica. Do you have an opinion on which is better for waterfalls between the two? between cetina and zrmanja which one do you advice us? I would recommend Cetina, just because if you go to Cetina you can stay in Split. I we prefer Split over Zadar (which is the best base if you want to do Zrmanja River). But, both rivers are great. what time of year is best for rafting? I will be on The Korana river late June but I am thinking a lack of rainfall might make rafting pointless? This looks amazing! Croatia is definitely on my must-do list. Great guide. Have you ever been on the Soča in SLO? Wondering how some of these rivers compare.